Grand Forks is the third-largest city in the State of North Dakota (after Fargo and Bismarck) and is the county seat of Grand Forks County. Kick off your visit on the 5th (Fri): stop by Widman's Candy Shop, then gain insight at University of North Dakota, and then bet on your favorite at River Cities Speedway. On the 6th (Sat), you'll have a packed day of sightseeing: immerse yourself in nature at Turtle River State Park. For where to stay, traveler tips, ratings, and other tourist information, you can read our Grand Forks itinerary maker. Use the Route module to find suitable travel options from Oakville, Canada to Grand Forks. Traveling from Oakville to Grand Forks, you'll gain 1 hour due to the time zone difference. Expect slightly colder evenings in Grand Forks when traveling from Oakville in August, with lows around 15°C. Wrap up your sightseeing by early afternoon on the 6th (Sat) to allow time for travel to Medora. Medora is a city in Billings County, North Dakota, United States. 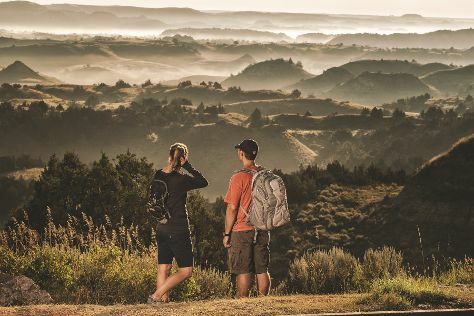 You'll find plenty of places to visit near Medora: Enchanted Highway (in Regent) and Petrified Forest Loop (in Theodore Roosevelt National Park). Spend the 7th (Sun) exploring nature at Theodore Roosevelt National Park. The adventure continues: explore the wealth of natural beauty at South Unit, get to know the fascinating history of Painted Canyon Overlook, and get engrossed in the history at Chateau de Mores. To find where to stay, ratings, other places to visit, and more tourist information, refer to the Medora travel itinerary creator. Use the Route module to find suitable travel options from Grand Forks to Medora. Due to the time zone difference, you'll gain 1 hour traveling from Grand Forks to Medora. In August, daytime highs in Medora are 31°C, while nighttime lows are 13°C. Cap off your sightseeing on the 9th (Tue) early enough to travel back home.